Sugilite is one of my favourite stones. However, the colours can be so different (depending on a stone) that I won't like sugilite just because it is Sugilite. I like it when it is light purple or purple with a little bit of blue, or even with some white sections. The stone in this pendant I like a lot! Every pendant from this collection is a "game". I do not make sketches, but decide on the shape of each stone, which of my sea creatures I would like to use; and how the wires should be arranged. 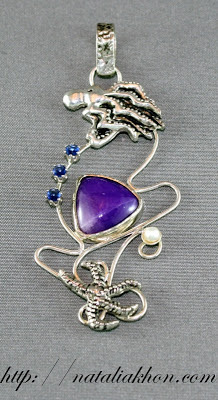 I felt that light-purple sugilite needed bright sapphires beside it (they are sapphire imitation stones, really). I am happy with my choice of this colour combination. Love it! White fresh water pearl is another lucky choice for this pendant! Sugilite is a fairly recent discovery (1944). It is found in Japan, Canada, India and Africa. The most important occurrence was found in 1975 in the Kalahari Desert in Africa. This is where most sugilites come from. The hardness in Mohs scale is of 5.5 to 6.5, that makes it suitable for jewellery, though preferably for the pendants and earrings. A ring is ok too, but only if you are naturally careful with your rings. For those who are spiritual, it is said that sugilite can have a positive effect in protecting one from harm, anger and other negative energies. 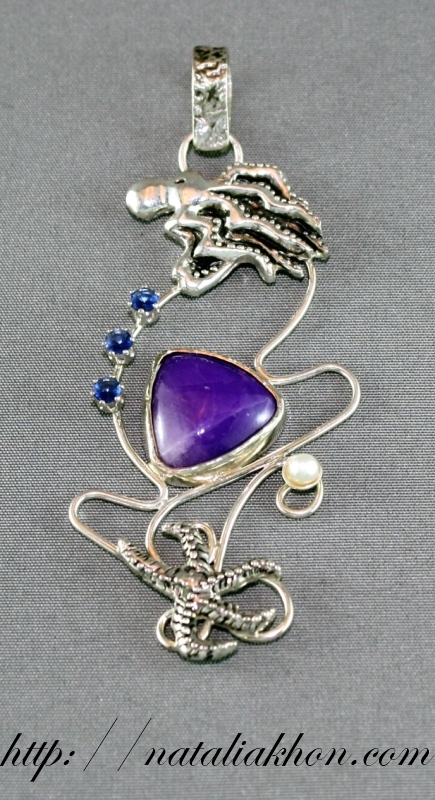 It is also said that sugilite strengthens the heart, aids physical healing and reduces stress. It is a balancer of mind, body and spirit; encourages peace of mind, a general feeling of well being and spiritual love.